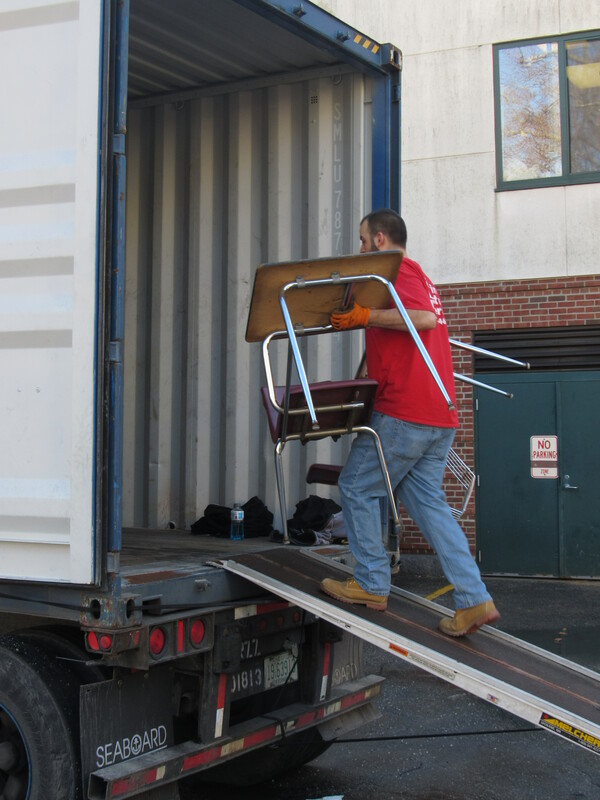 A couple of weeks ago Concord High School and IRN joined forces to send about 150 excess desks, chairs, work tables, library shelves, and other items to our nonprofit partner Food For The Poor in Jamaica. Like every school, Concord High accumulates excess furnishings. All the time. A couple of desks last month. A few chairs this month. Some library shelves and book carts next week. They don’t have any further use in the school, but they’re too good to throw away. So they end up in storage rooms and basement hallways. And eventually, they are not a few any more. They are dozens and dozens, and they’re in the way. That’s when Concord High calls IRN. IRN runs a worldwide matchmaking service for surplus furniture. When an organization like Concord High approaches us with furniture that needs a new home, we reach out to our network of more than 125 nonprofits. Depending on what’s in the inventory, the best match may be a local Goodwill or a Habitat for Humanity ReStore, a charter or tribal school, or an international charity somewhere on the planet. Our job doesn’t end when we make the match. 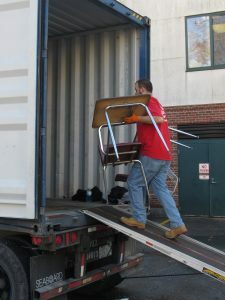 We arrange trucks or tractor-trailers to come to the school, set up a moving crew, and make sure the trucks are packed with as much furniture as they can hold. Then we lock the doors, and the furnishings are shipped to their recipients across town, across the country, or across the ocean. The best match at Concord High was Food For The Poor. When we had it loaded, Concord High’s trailer went over the highway to the port at Elizabeth, NJ, then by container ship to Jamaica, and finally by truck again to FFP’s warehouse in Kingston. FFP builds and furnishes homes and schools not only in Jamaica, but in more than a dozen other countries, and the shipment from Concord High may ultimately be divided among many communities. IRN doesn’t get any money from FFP or any of the charities we work with. We’re paid by the organization that has the surplus. In almost all cases they pay IRN less than they’d pay a trash company to just throw their old furniture away. Please let us know if you have questions or comments, or if you have surplus that needs to find a new home.